The second part of “The History Of Heresy” will be out October 24th. Besides featuring both albums: “Bible Of The Beast” and “Blood Of The Saints” with bonus tracks, plus “The Sacrilege Symphony” orchestra album, the boxset includes the second part of the autobiographic hardcover book. 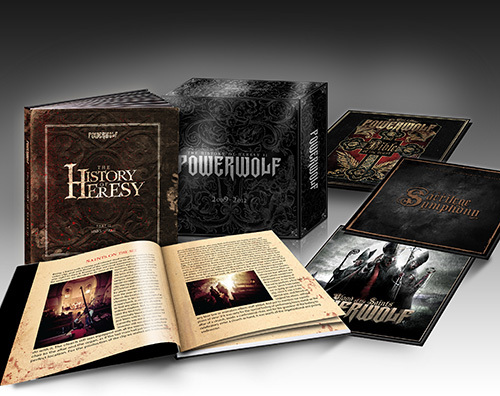 The book, “The History Of Heresy,” includes 128 pages full of candid stories, as well as tour, and studio reports. A ton of pictures will be included in the box which comes in lavish hardcover box matt laminated with embossing and partial gloss vanish! Copies are available for pre-order now in Europe at emp.de and the official Metal Blade ebay store ebay.de! POWERWOLF will celebrate the release during their two upcoming shows in November.